These small fungi with vase-shaped bodies are usually found tightly packed together growing in potting mix and in litter particularly if some dung is present. 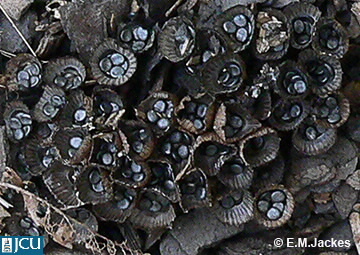 The outside of the fruiting body of this species is hairy and fawn-colored, becoming grey. Inside is a shiny grey and the upper portion is internally striated. In the base there are the ‘eggs’ or peridioles, which are splashed out by raindrops. Several species may be found together.